school log books which were completed by the head teachers' and pupils' memories. 1930 Vicar Rev Walder Teachers: Mr Pegler Headmaster; Miss M Knight; Miss K Waite. 11 April 1930 Choral Group won Silver Cup outright. 1 May 1930 School Closed - Visit by Princess Mary to Weymouth. 31 July 1930 Miss Waite left. 30 Sept 1930 Mr John Pegler's last day as Headmaster. Resigned as he had reached his 65th Birthday. 13 July 1933 School closed due to visit to Weymouth by the Prince of Wales. 16 Jan 1934 Woodwork class transferred to Reynolds Institute. Upwey boys attend on Tuesday afternoons. 9 May 1934 School closed afternoon for Football Tournament at Weymouth. 25 Jan 1935 26 children exempted to prevent the spread of Foot & Mouth. 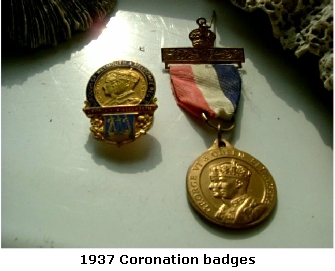 6/7 May 1935 School closed for Silver Jubilee of King George and Queen Mary. Children aged 7+ took part in the Borough Celebrations. There was tea and entertainment for Infants on Wed 8th. The Mayor, Mr Guppy and Councillor Attwooll visited and presented Souvenir Spoons. Thro ugh The Ages'. Every school in the Borough took part in a procession staged between St John's church and the King's Statue in Weymouth. A sports day and tea was organised for all schools at various venues around the town. 277 children from Upwey, Broadwey and Radipole came together at Broadwey Rectory Field on the afternoon of Thursday 13 May. Councillors P Lovell and H Medlam helped Rev E Walder (Broadwey) and Rev A Bryant (Upwey) with the smooth running of the various events. The Mayor (Councillor Bert Biles) spoke to the children at the start of the afternoon, using amplifying apparatus which Messrs Bennett and Escott had provided to assist with announcing events. At the end of the afternoon, tea was served by the teachers. As there was no building large enough to accommodate all the children together Radipole returned by bus to their school; Broadwey returned to their school and the Upwey children had tea in the Temperance Hall on Broadwey Hill. 9 Dec 1937 Senior pupils taken to the Odean cinema to see a League of Nations Film. 11 April 1938 Pupils aged 10+ taken to Alexandra Gardens to see a Milk Publicity Film. 11 May 1938 School closed - Boys attended 6-a-side football tournament. 2 June 1938 Talk by RSPCA. 23 June 1938 Miss Knight attended Girl Guide Rally at Canford in the presence of HRH the Princess Royal. 24 June 1938 3 teams take part in Folk Dancing at Bovington. 21 July 1939 Pupils 7+ taken in buses to Weymouth Promenade for the visit of the Royal Family. Vivien Atkins was chosen to present a bouquet to Princess Elizabeth. 27 Nov 1939 Normal sessions resumed - 2 classes Standards 3/4 and 2 sharing the Temperance Hall with 2 classes from Acton. 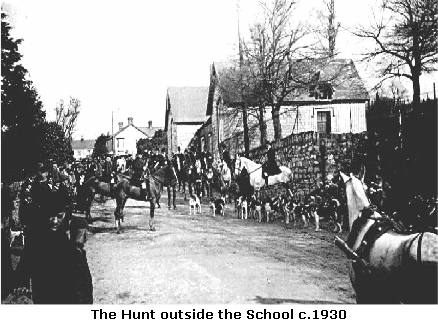 14 May 1940 School reassembled by Government Order, cancelling Whitsun Holidays - were due back 21 May. 1 June 1940 French soldiers from Dunkirk billeted in Broadwey and district. 14 Oct 1940 School reopened for registration of children whose parents wished to register them on a voluntary basis. The remainder of the 37 Acton children have been absorbed and Mr Howells and Miss Howard attached to the school for duty. 12 June 1941 Miss Luckham, Air Raid Warden, examined the children's gas masks and found quite a number defective. There were regular inspections until 1944. Nov 1941 Children immunised against diphtheria. Dec 1941 Miss Knight married becomingMrs Rolstone. 21 May 1942 A Mobile Cinema show given at Station Approach - War Savings Campaign Advert. 2 Sept 1942 School meals commenced - 24 pupils had meal which was of excellent quality and very much appreciated. 6 June 1944 Attendance very low 66 out of 186. Parents refused to send children to school owing to unexploded bomb having fallen at the rear of the school (70yds away) on 27 May. 11 June 1944 1000 kilo bomb removed today. 20 Nov 1944 American Exhibition visited the school- senior pupils from Preston and Upwey also attended. 1 March 1945 Ministry of Information films shown. 12 Oct 1945 Nurse Allgood, was the school nurse (she retired in 1964). 2 July 1946 All children taken to Regent Cinema to see Victory Parade Film as part of the Children's Victory Celebrations arranged by the Borough Council. Had teas on 5 July. 16 July 1947 Folk Dancing at Bovington. 9 Oct 1947 Senior class visit Dorchester Museum. 30 Jan 1948 School closed for demolition of Air Raid Shelters. 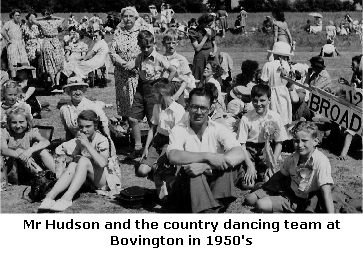 27 May 1948 Folk Dancing at Bovington - 72 children and 2 teachers attended. 23 Mar 1949 Sgt Paine gave a Road Safety talk to the children. 21 June 1949 Pupils taken to Weymouth to see HRH the Princess Elizabeth and the Duke of Edinburgh. 1 Sept 1949 Miss Jacobs commenced. 1 year to gain the Trained Certificate. 10 July 1950 appointed Qualified. 20 July 1950 School sports in Rectory field. 4 Sept 1950 Mr Cheeseman appointed. 6 Nov 1950 Mrs Hutchings appointed school cleaner. 1 Jan 1951 Mrs G Dowding and Mrs E Stokes made permanent. 2 Sept 1952 School closed as mark of respect to Mr Coombs. Memorial service held on 5 September. Coronation Mug filled with 5oz sweets given by Weymouth Corporation who also gave £11.10.0 (being 1/- per child) towards the cost of a Celebration Tea to be held in Broadwey Secondary Modern School canteen on 2 June. 3 day holiday 1-3 June. 15 June 1953 All children taken to cinema to see 'A Queen is Crowned' the official record of Coronation Day. 12 June 1953 Cycles examined by PC Foster. 29 June 1953 School Crossing Patrol Mrs Carter started duties morning, lunchtime and afternoon. 6 Jan 1954 Mr S Allen commenced. 6 May 1954 Standards 2/3 taken to Sidney Hall, UMCA Exchange 'In Livingston's Trail' accompanied by Mrs Dibben and Mr Allen. 14 May 1954 Standard 3 to BSM for Educational Puppet Theatre. 6 June 1954 The safety barrier outside Infants' gate destroyed by a car. 14 July 1954 Folk/Country Dancing at Bovington. 20 July 1954 Sports held in Mr Westmacott's field. Cup awarded to Red Team. 6 Sept 1954 198 on roll. Nottington Camp now closed (temporary housing in the grounds of Nottington House). 15 Dec 1954 National Savings Handwriting Competition - Glenis Hart (Class 3) won First Prize and Stephen Wadhams (Class IV) Third Prize. 13 Jan 1955 12 pupils with Mrs Dibben attended the Broadwey Veterans Meeting and gave a puppet show. The puppets, made by the children, were examined with interest by members of the club. 4 May 1955 60 out of 205 away with whooping cough or flu. 19 July 1955 Due to flooding in the great storm last night most of the school is unusable and the children were sent home. 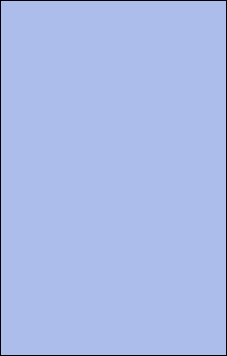 The two middle classrooms; the cloakrooms and the tunnel are flooded. The Infants Room was used as a rest centre for Royal Marines assisting with the salvage operation. The Temperance Hall was used as a rest centre for people who have been flooded out of their homes and caravans. Reynolds Institute was flooded and floors muddy. 21 July 1955 School reopened.